OSHA’s 29 CFR 1910.146 states that if your personnel are entering confined spaces, the employer must provide a competent rescue team to provide emergency rescue within a timely manner. Whether your facility is small and does not conduct enough confined space entries to warrant your own team or you just want to supplement your existing teams on certain occasions (i.e. plant-wide shutdowns), ERS, Inc. can respond to your needs. 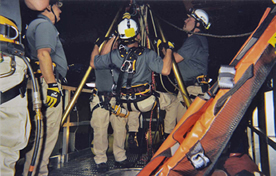 Our contracted confined space rescue teams are second to none. Comprised of trained and highly experienced rescue personnel, ERS, Inc. can supply your company with teams that are fully equipped to perform rescues, if necessary. Our teams can remain on standby around the clock if needed, not only for rescue, but safe entry advice to entry supervisors as well, which adds additional safety during the operation. For outstanding standby teams and huge peace of mind, call Emergency Response Services, Inc. Today!